Rediscover Wisconsin history from the very beginning. A Short History of Wisconsin recounts the landscapes, people, and traditions that have made the state the multifaceted place it is today. With an approach both comprehensive and accessible, historian Erika Janik covers several centuries of Wisconsin’s remarkable past, showing how the state was shaped by the same world wars, waves of new inhabitants, and upheavals in society and politics that shaped the nation. Swift, authoritative, and compulsively readable, Janik finds the story of a state not only in the broad strokes of immigration and politics, but in the daily lives shaped by work, leisure, sports, and culture. 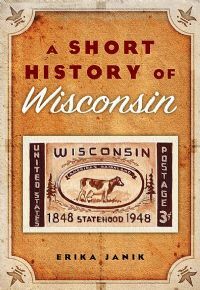 A Short History of Wisconsin offers a fresh understanding of how Wisconsin came into being and how Wisconsinites past and present share a deep connection to the land itself.